As you all should know by now, we're off our hiatus! WOOHOO! Assessment is finally over - it has been a grueling two weeks that has worked both Ashley and I to the bone. We've really very close to died; I had nausea and breathing difficulties and Ash came down with a fever. Terrible isn't it? We are so sorry for disappearing, but here's a quick Instagram update to keep all of you in the loop of our past week! 1. We had a wonderful High Tea set at Plaza Singapura's Canele. It only cost us $29 in total (with GST) and we had 2 mini burgers, 4 egg mayo sandwiches, 4 macarons, 2 scones, and 2 quiches. Everything was finger-food sized, and really quite delicious. Very much worth the price. 2. 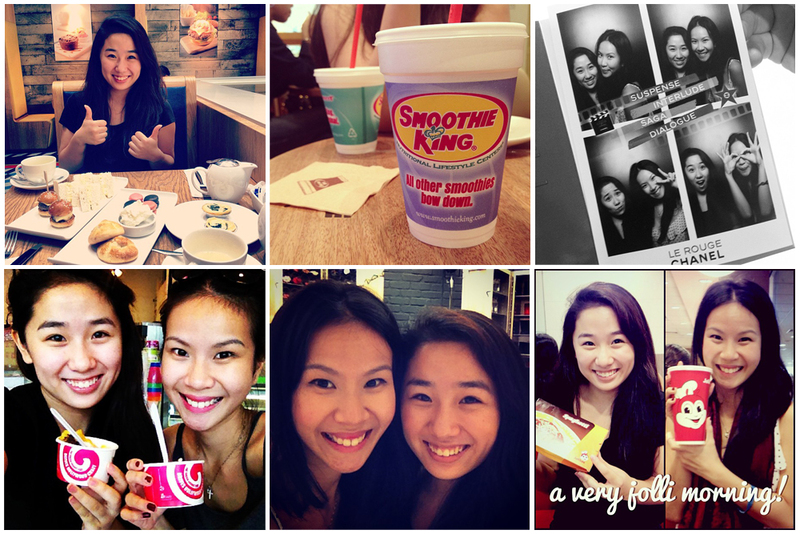 Ash and I have recently discovered our newest favorite hangout: Smoothie King! There's one at Somerset 313 (right outside the MRT exit) and one at Centerpoint. Their smoothies are light and yummy, and ever so healthy. They also serve very affordable and delicious wraps. If you're looking for a healthy alternative to your meals, you can always try this out. 4. Ashley stayed over at my place for a night whilst we prepared for our assessment. Here's us, sans-makeup, on a quick trip to the froyo shop for a rest! 5. After submitting our work (hooray! ), we took a trip to town for some well-deserved shopping. We got some makeup and skincare that we will definitely be reviewing soon! Do look out for it. We spent close to a $100 each that day, which pains our wallets but not our hearts! Hehe. 6. Here's Ashley and I looking extremely pleased to have gotten in to Jollibee. The previous time we went, there was a SNAKE QUEUE out of the restaurant. Craziness, all that just for fast food! It was rather good though, and pretty cool to have fast-food spaghetti. That's about it so far. How has YOUR week been? wohoo, looking forward to some reviews! Cute photos! Glad you're done with your assessment - it's got to be so nice being done. And whoo - Froyo is the best for a nice break when you've been working too hard! You guys look like siblings! Yes we get that a lot! Guess it happens when 2 people spend tons of time with each other! Looks like an exciting week dear!! Can't wait for he new reviews on all your new products!! Hi guys mind reviewing laura mercier tinted moisturizer vs tinted moisturizer oil free vs clarins uv hp plus beige? Sorry if it seems like a weird comparison but I am caught in the loop deciding between this two..
we don't mind doing this comparison (we only have tinted moisturizer oil free on hand) but it might take awhile :( We have a few backed up posts and are juggling a few other things.